The traveller from outer space chose his final resting place right on the piste, narrowly missed by a couple of 4WD tracks just a few yards away. Smoothly ablated, the rock shows slight orientation, disturbed only by a small, rougher flank covered with a fine layer of secondary crust. After a series of photos I lift the stone out of its dust bed. It’s slightly magnetic. 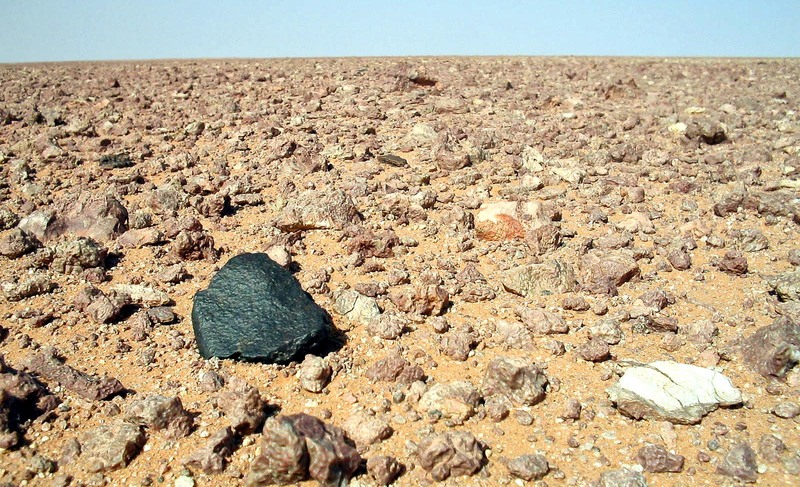 Later back home, the analysis by the Institute for Planetology of the University of Muenster will reveal its nature as type 3 unequilibrated chondrite with a short terrestrial residence time. Given its fresh and unweathered appearance, the fall might have occured just a couple of decades ago. 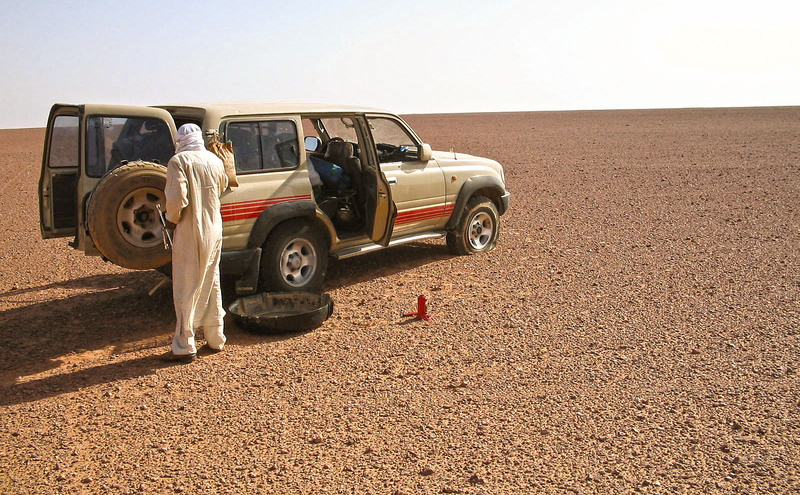 In high spirits we search for further fragments until Moonrise before we return to our camp which Ammul has erected on the exact location of the find. This night the boys insist on calling me “Abu Ah’schar”, “The father of the stones”. Chilling near the fireplace, Saleh takes a closer look at the Moon with my Zeiss binoculars. As a young boy he had heard about the Moon landing on his grandfather’s radio. The way he recollects the subject does not diminish his scepticism towards the plausibility of such an endeavor whereas Ammul the Touareg from the Air Mountains shows a rather unbiased approach to the achievements of modern civilization: “The airplane is a flying tent”. Our satellite telephone works by the use of the wind. The Moon rocket, he once saw on television, is an iron can. In its interior the Americans imprisoned a djinn. The djinn receives beating by its jailor until he is willing to work and to boost the machine with his glowing exhalation. 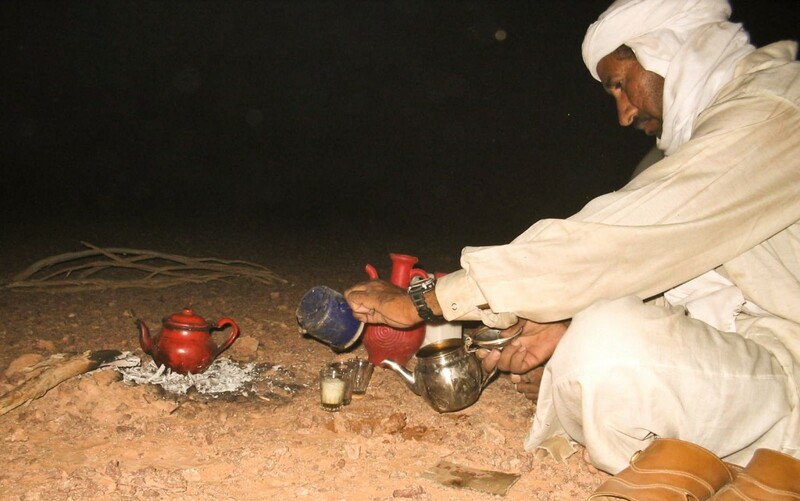 Saleh Ali brewing tea. When Allah made time, he made plenty of it. Encouraged by the cold morning breeze we start early the next day. But if it hadn’t been for Salehs green tea with its delicate aroma of kerosene, not even an impacting anorthositic highland-breccia would have dragged me out of the sleeping bag at five thirty this morning. Rolling out into the open a few miles, the day begins with a flat tire. The third over the last three days. My crew deals with the problem while I decide to continue the search awhile on foot. We maintain contact via radio. When the other two catch up an hour later to collect me, I lose no time to put a protective roof between my head and the blazing sun. The metal of the car is already hot beyond touching. A flat tire. Opportunity for an extended walk. We’re merely a hundred yards on the track and already in the middle of an inspiring discussion about the assets and drawbacks of polygamy as encouraged by the Islamic belief. My attention in the admittedly interesting subject dies abruptly when I notice a chunk of dark rock passing the corner of my eye. “Halt!” Getting off the vehicle, I notice more dark debris in a wider perimeter. Probably we’ve run over another shattered fireplace of Neolithic origin. Wondering about the pseudo-meteoritic appearance these specific rocks display, we’ve come to the conclusion that once the magnesium in the dolomite has become oxidized by fire, its surface is vulnerable to the effects of desert varnish. 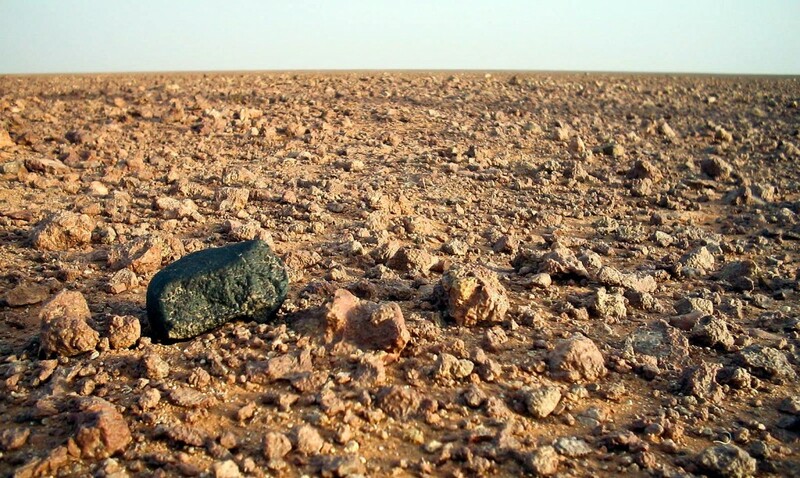 Within a few centuries such stones are coated black. But unlike the other prehistoric campfires we came across, this particular one completely lacks the usual flintstone scrapers and petrified bones. Sale Ali parking in the center of the HaH 336 find cluster. The 309 g HaH 336 main mass in the foreground. I walk over to check the stone that drew my attention first. As the magnet flips to the weathered rock I hold my breath. In the same instant Saleh gives a yell from the far side of the car: “Alhamdulillah”, “Praise to Allah” he shouts, reporting another fragment. Judging by his excitement he must have found a second Hoba mass. A few seconds later, Ammul joins the club twenty yards to the left. Feeling like Sinbad the sailor in the diamond cave, I stand amidst unforeseen treasures not knowing where to move first. Dazed by the outspread cosmic jewellery, I pay tribute to the panorama. Obviously all of the 24 fragments we now register stem from the impact of a single kilo-sized stone. They are all resting deeply buried in the sediment. Like the tip of an iceberg only a small edge of the 380 g main mass protrudes through the gravel surface. Solid but with no trace of a crust, the stones appear far more weathered than the common HaH finds. Also the original distribution pattern resulting from fragmentation upon impact seems to have been disturbed subsequently. Some of the smaller fragments fit together with the core- mass but have been shifted to a position a hundred yards to the south. 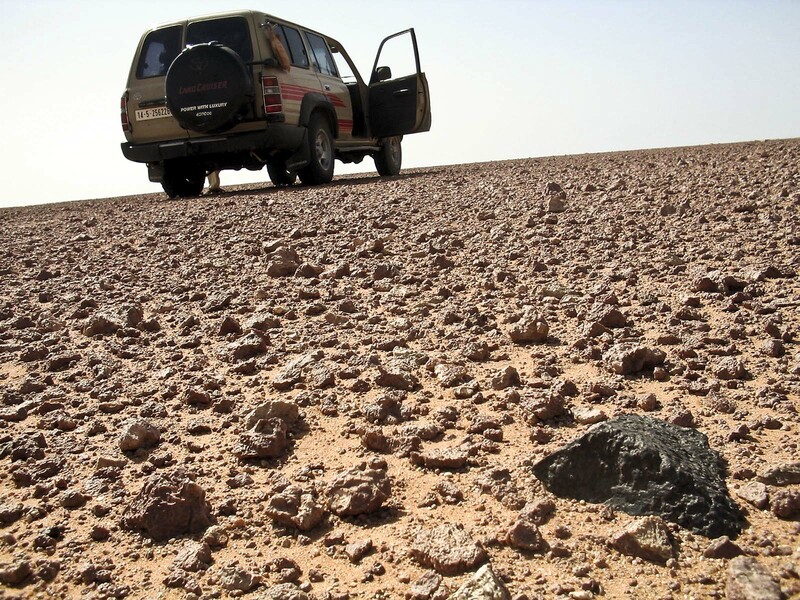 Pieces smaller than 8 grams are missing, a phenomenon that is significant for the entire HaH meteorite field.